Welcome to Day 12 of the 31 Days of Halloween! This is an annual Smeared Ink event and we are so thrilled to be playing along as Wicked Bloggers. The Wicked Blogger challenge is to post a new creation each day during October that contains a stamped image, digi or rubber! Check out all the rules and prize details at Smeared Ink. Today is my turn, CT kim. The background started life as a failed stamping item, set aside and not tossed at the moment. I gave it some life today for this ATC. The background is stamped using Lost Coast Designs on a Distress Ink colored base. The angel and zombie dude are Viva Las Vegas Stamps, they are heat embossed in black, colored with Distress Inks. 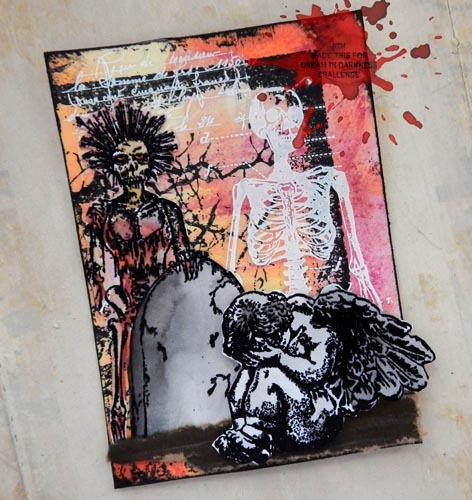 The white skeleton is a Tim Holtz image rub on. This is so scary and haunting piece. Perfect creating in other words. Very scary with the zombie in the background and that sad little angel in the foreground. Has great atmosphere and tells a creepy story too. Great job! I am absolutely loving this ATC! The background is fabulous, and the weeping angel is just perfect. Oh wow this is great and also soooo creepy! the zombie dude is pretty scary. Poor little angel - she's crying her eyes out. Creeptastic ATC today Kim, love all the details! This is awesome! Perfect Halloween make! oh I love the weeping baby angel this is fabulous. This is one spooky ATC... never throw anything away... you never know when they may be revived... GREAT REVIVAL!!!! Love all the images!!! Thanks for sharing!! Glad we're on the same team! great creation.